If you’re going to take full advantage of high grain prices, it helps to have a partner who can help you navigate today’s volatile grain markets. Count on River Valley Cooperative for basis contracts, minimum price contracts, hedge-to-arrive contracts, price-later contracts, priced-forward contracts, deferred payment contracts, direct deposit of grain checks, grain hauling services, and grain market insights. More than 27 million bushels of licensed storage space at our 14 elevator locations. Our facilities at Olin, Dewitt, Ryan, and Martelle are equipped with 15,000 to 30,000 bushels per hour of receiving capacity. Two locations (Galva and Sunbury) are connected with feed mills that utilize 25,000 bushels of corn per day. A direct-ship program that allows you to ship grain to local terminals. Bushels can be delivered to a number of delivery points through different freight options. The same marketing options that are available for grain hauled into our elevators are also available on direct-ship bushels. We offer multiple delivery points and can price the grain either delivered or as farm pick-up. There are no current Cash Bids to be displayed. The market summary this week is dominated by the report last Friday on US grain stocks and US planting intentions. Needless to say, from a producer’s perspective, the reports were disappointing and set a stage for a muted price response this spring and summer versus expectations prior to the reports. Our bias coming into those 2 reports were that the acreage may be a bit higher than trade guesses, but those numbers would not have been influenced by the western flooding and further delays into April due to all the excessive rain. Our view is that we have seen the largest acreage number for corn from the USDA. They will use this acreage number in April as well, but May and June could have some revisions lower given what we see today. The US quarterly grain stocks numbers were the biggest surprise to us as we were expecting a tightening in supply given what we see in the feed sector and to come in 280Mbu higher than expectations was very discouraging. Taking a look at weather into the end of April, we can only say that we are highly concerned given the forecasts we see and impacts that may have on final acres. After a mild couple of days into early next week the forecasts turn colder and wetter for much of the region which is exactly the opposite of what we need. If the forecast holds true for April it will be the 9th straight month of above average precipitation for the corn belt states region which has never happened before in the 125 years of recorded weather history. We know producers can get a lot done in a short amount of time if given a window to go. At this point we do not see that window. In the past the market has not rallied all that much on planting delays due the fact that once the crop is planted it will start with a lot of moisture to draw from. This year, in conjunction with all the fieldwork we are behind on, the spring feels primed to test the patience of the short managed money crowd which stands short 263k contracts currently. On the political trade front with China our comments are more of the same from the past few months. The talk seems to be going well and officials from both sides seem to feel a “deal” will get done very soon. However, the market has zero patience left for this rhetoric as evidenced by today’s market action. Trump’s comments of something getting done within 4 weeks was not received well by the market today. One interesting development since the crop report on Friday is how the corn spreads from old crop to new crop widened out substantially. 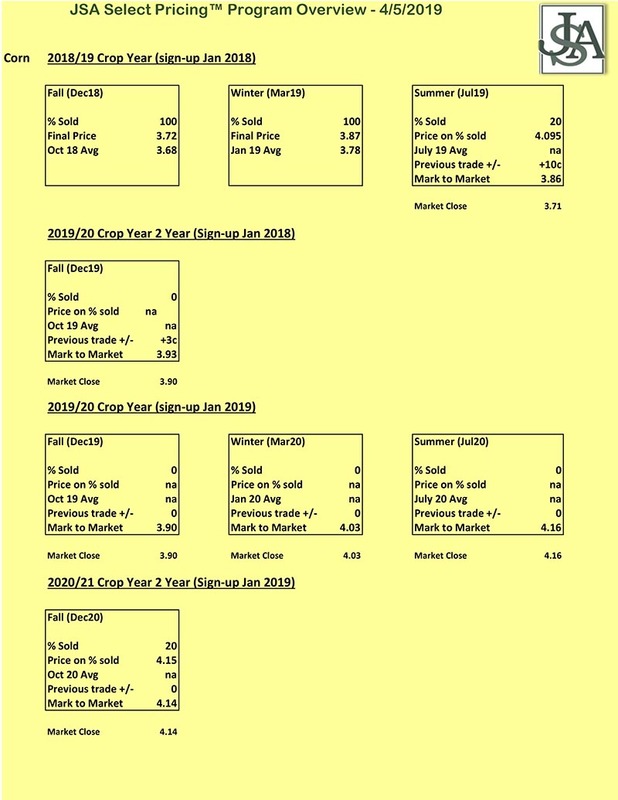 In fact, we saw old crop this week still 7-8c below pre-report levels while December 2020 traded 5c above pre-report levels. It is for this reason we took advantage of that carry pricing 20% of our 2 year Fall 2020 program at $4.15. We have additional levels working about a dime higher near 4.25 as well. In our remaining summer 2019 and fall/winter 2019 positions we have yet to make a trade since the pricing period started in February. Even though the report took a little wind out of our sails for the time being we feel good opportunities still remain. 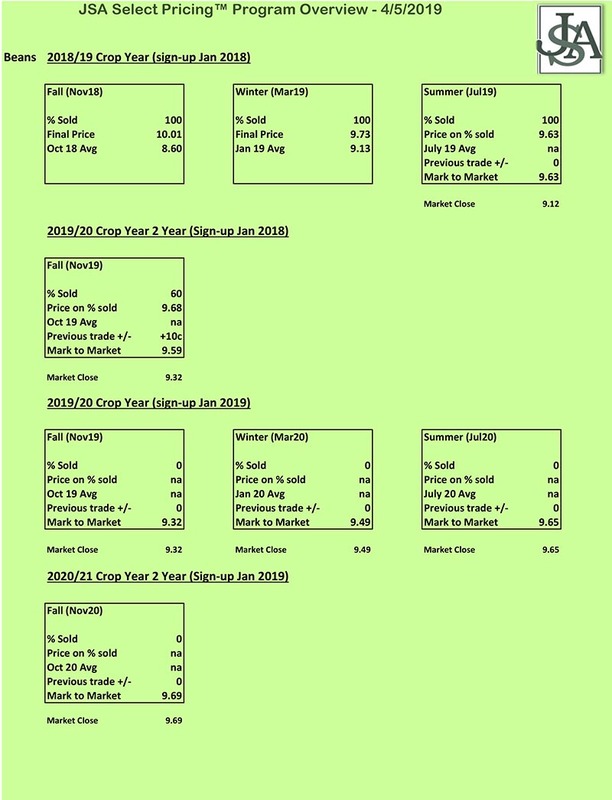 July corn in the 3.90 range and new crop Dec 19 corn between $4.00 - $4.10 remain our objectives to establish futures hedges as well as initiate option strategies to lock in production. In soybeans we have not made any additional sales with all old crop positions 100% sold. In our 2 year program signed up last year for fall 2019 beans we are 60% sold but have yet to make a sale in the fall bushels signed up this past winter. Our targets remain in the 9.60+ range for fall to add to sales while selling further deferred carry in the market for next winter and summer are closer to 9.80. The wheat market remains at the low end of our range ideas. Our targets remain closer to $5 July futures but recognize we are running out of time of a meaningful trend change in KC wheat. Our program is designed to provide grain producers flexible pricing programs and delivery options based on the needs of your farming operation. Utilize futures and basis contracting to support pricing opportunities on grain marketing. We offer transportation and logistics support for timely and cost effective delivery to market. In addition, utilize technology services aimed to improve the communication, execution and recordkeeping of your grain marketing supported by your Grain Marketing Team. NEW! Try our Equivalent Price Calculator Tool. Plug in your data into the shaded boxes on the downloadable spreadsheet to see the price equivalent on your crops.